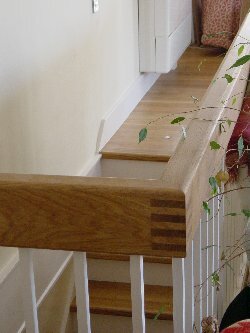 This is a detail showing the 200 x 75 solid oak handrail detail we used on all of the staircases. The top floor of this house is used as a lounge with balconies to two sides. 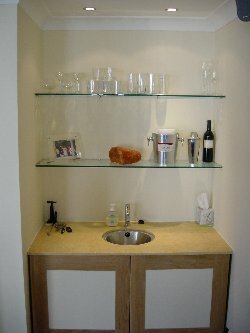 Marble topped cupboards are formed either side of the gas log effect fire, this one with small sink to serve the mini bar. 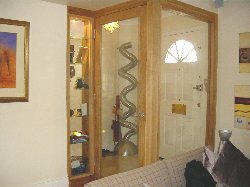 A fire resisting screen was needed to allow safe exit from upstairs, but the client wanted it to be as "open" as possible. The sceen is made of 15mm thick fire resisting glass. In the corner of the lobby is a stainless steel "curly" radiator which as coat hooks projecting at different levels. 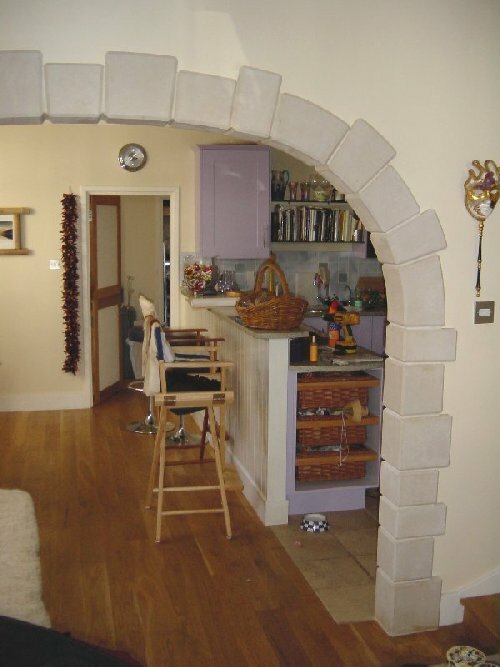 A stone arch connects the ground floor "snug" living space o the kitchen dining area (kitchen apart from granite worktops was designed by others) The arch is solid Portland Stone and the surrounding wall is ofstud and plasterboard. The floor is solid oak strip.